CAPE TOWN , Jan 27 2012 (IPS) - If there was no HIV/AIDS, South Africa would have 4.4 million more people than today, the size of a major city. This significant slow-down in population growth is causing a slow down in economic growth and resulting in social ills, researchers warn. New data by research organisation South African Institute for Race Relations (SAIRR) show that South Africa should theoretically count 55 million citizens this year. But it only has a population of 50.6 million. By 2040, the country’s population would have been 77.5 million without AIDS – 24.1 million more people than is projected for that year. “The decrease of population growth has a negative impact on South Africa, because the group most affected by HIV and AIDS is aged between 15 and 49 years, which is the most productive part of the population,” explains SAIRR researcher Thuthukani Ndebele of the date published on Jan. 23. “If this age group continues to die early, we will see an acute social and economic impact throughout the country,” he warns. South Africa was quickly losing large chunks of its workforce and skills, which led to loss of productivity. The institute’s analysis – which is based on statistics sourced from the Actuarial Society of South Africa and the South African Institute for Futures Research – shows that almost a third of all deaths in 2011 were AIDS- related. By 2025, this proportion is expected to rise to a whopping 121 percent more AIDS deaths than there were in 2000, according to SAIRR. SAIRR further predicts that the total number of people living with HIV/AIDS will reach six million in 2015, which is double the number recorded in 2000. “This should be a serious wake-up call for South Africa. It would be a serious crisis for the country’s economic and social development to reach such a high number of HIV infections and related deaths,” says Hornsby. Not only does HIV/AIDS reduce life expectancy and increase mortality, but it is largely responsible for wider social ills such as orphanhood and child-headed households. In 2009, about two million South African children had lost one or both parents, according to United Nations Children’s Fund (UNICEF). The large number of orphans in this age group as well as households led by grandparents have started to create an increased level of dependency on the social welfare system, which demands an ever bigger growing slice of the country’s national budget. South African social welfare organisations confirm persistently increasing levels of destitution due to HIV/AIDS. 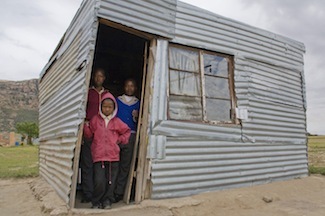 “The numbers of families in need, people who are unable to meet their most basic needs, are growing continously,” cautions Bernice Roeland, director of Cape Town-based non-governmental organisation AIDS Response. She worries that without a concerted effort to prevent new HIV infections and handle existing infections more effectively, the future burden on South Africa’s social welfare system will soon become unbearable. SAIRR researchers say they are particularly concerned about the increased burden HIV/AIDS will have on the public health system. According to the World Bank, South African spent almost nine percent of its GDP on health in 2009 – almost double the amount than most developed nations. This percentage might increase in the near future even further. “Nine percent a significant amount. Health budgets might have to increase even further, if governments wants to prevent HIV/AIDS having an even more negative impact on the economy than it already has,” says Ndebele, pointing out that because HIV-positive people live longer due to live-saving treatment with antiretroviral (ARV) medication, they also incur large amounts of health care expenditure before their deaths. “AIDS deaths therefore cost government a lot of money. It’s not like dying in a car accident,” says Ndebele. But there is also an upside: increased access to ARV treatment does help HIV-positive adults to stay economically active for longer, thus alleviating other costs to the social system. Experts from research, economic and social sectors therefore all stressed the urgent need to make a bigger effort to prevent new HIV infections – as the only way to effectively reduce the costs of the illness places on society. involuntary closure of the right eye . i couldn’t see nor do anything . join me to thank this man worthy to be called my great and powerful father called Dr okoje Last time i met a comment online against the great and powerful work Dr okoje has done with her HIV/AIDS ailment. i will thank Mrs Bernille for letting the world knows the powerful man that help her from AIDS disease. This was what i have all my life been waiting for since i was infected by HIV last 6 months. I always spend money for drugs always but still yet my weight becomes poorer and my joint always getting painful and inching all day. But when i met this comment last 3 days, i quickly contacted Dr okoje the Traditional helper. He is from the western part of Africa, i didn’t spend much as i spent for drugs each day, and i for the fact truly reason this because my life was already as take by this disease called AIDS. Truly, when it was 9 o’clock on Monday this week he called me that his oracle urgently required some few life items to enable the disease wipe out successfully, then i was asked to send down 200usd ($). Which i did. He truly bought the items and surprisingly, yesterday afternoon Dr okoje called me that my work has been finally done and it work out well. I was glad and he told me to rush down to my hospital for checkup. Which i really did, my brothers and sisters i went down crying because no one has ever done this to a person in life. Dr okoje truly healed me. I was crying it was a dream to my eyes when the doctor said to me that I am HIV NEGATIVE. I am now a free born in life, am now like other people who now think things like human. For these days and forever, i will accept Dr okoje as my father and my healer and helper. He is a great man. Thank you sir. I know i cant reward you. But my God in heaven can. Thank you sir once again. powerful great spell caster who decided to wipe out tears away from eyes. call she keep on calling an i decided to switch off the phone. BEWARE OF SCAMS!!! DR MALAIKA ODOGWU IS THE ONLY SPELL CASTER TO TRUST! ( odogwumalaika@gmail.com ) will be of great help to you. in less than 3 days and reversed the effect of her lost womb, and at the end of her testimony she dropped Dr Malaika’s email address. my Hubby came begging. We resolved our issues, and we are even happier than before, am pregnant now to God be the glory. I didn’t pay much and all I have to do is send him little 250 dollars which he used in providing the materials used for the spell. and he will also help you as well with his great spell caster, THANKS BE TO DR LAWCY………………………. BEWARE OF SCAM!!!! Greetings to the world, My name is Mrs. LIZZY BENJAMINE I am from Poland am writing on what I passed through in my life, I have been barren for more than six years and my husband was no more happy with me, everyday was like a war in our lives both his family members were not happy with me, my life turned upside down and I never believed in any spell caster in my life because most of them are scams, but my friend Victoria made me know that (DR AGBALAGBA IS THE GREAT SPELL CASTER SOMEONE CAN TRUST) she gave me his email and when I contacted DR AGBALAGBA he made me believe that he is really indeed a GREAT ONE. Now am having my twin, a baby boy and a girl. Am happily living with my husband, no challenges you are passing through that DR AGBALAGBA can not be of help to you….contact him now so your problems will be solved AGBALAGBATEMPLE@YAHOO.COM. Been a HIV positive is just like been through hell but EVERYTHING IS POSSIBLE. So amazing and i want to testify of the good work done by GREAT DR a very strong and powerful spell caster. GREAT DR has proved science and scientists wrong for believing and thinking that there is no cure for HIV AIDS but to be sincere this GREAT MAN is so real and powerful. I never thought that this spell will work but this GREAT MAN has proved it to me and it has worked and still working perfectly. My Name is Henry west and i was diagnosed of the deadly disease called HIV AIDS in 2011 and i thought that is the end and there will be no hope. Speaking to anyone was always a problem because i was so worried and always in the state of unrest in fact i thought it was over until one blessed day when i was searching for help here on the internet, i came across a testimony about GREAT DR on how he helped a lady who was HIV positive. At first i thought it was all a lie but i decided to give it a try since there was no option and, when i contacted this MAN he laughed and told me that, that is too small for him to handle but i was still in doubt, and he gave me a form to fill which I did, then he called me and told me that his gods required some items in which he will use in casting a curing spell on me and he told me that it will cost only $500, I sent him the money because I could not find the items. He bought the items and prepared a cure for me, and instructed me on what to do and i OBEYED him completely as he told me. Then he sent a parcel to me through the courier delivery service. I paid for the courier service, I got my parcel, it was a holy water and a pure holy oil as described by GREAT DR. I took the holy water and the holy oil and after taking it, he told me to go for check up but I was still in doubt and was so afraid to go for the test but i took a bold step and believed that it is well, and i believed all what he has done and all that he has told me. So i went to the hospital for the test it was so amazing, awesome and exciting what seems to be impossible became possible, the VIRUS disappeared completely from my system and I was tested HIV negative. Quickly I called him and told him what happened he congratulated me and today i am a happy man again the way things use to be. Don’t you think that this testimony is worth sharing? I promise to tell the world about him and i will keep sharing this testimony till the end because many people has died of AIDS and i want many people who believed that it is over to know that EVERYTHING IS POSSIBLE AND I WANT THEM TO GET HELP FROM THIS SPELL CASTER by contacting him on his email at dr.skhivhomefcure@gmail.com for your solution now. If you are hiv positive and you think that it is over i want to tell you that there is hope for you and if you truly and dearly value your life please contact him now. THIS IS REAL HE IS NOT A SCAM, BELIEVE HIM AND DON’T ASK TOO MUCH QUESTIONS. Thank you GREAT DR and May your good gods keep rewarding you for your good deeds. My name is Tracy Adams, I was diagnosed of this HIV deadly disease. A friend of mine introduce me to Dr Ogbodu, and I actually did contact him, after he has prepared the medication, he sent it to me and I used it according to his prescription, after 2 weeks, I went to the hospital to check my status again because I was feeling differently from the way I used to when I was tested POSITIVE, to my greatest surprise the status was NEGATIVE , the medical doctor there was surprise. I have to tell the whole world about this. If you are still having this similar problem, I recommend you to Dr Ogbodu for you. Here is his email address: [ogboduherbalhivcure@gmail.com] you can contact him any time. Hello everybody i am so happy to share this testimony on how Dr Molemen was able to heal me from HIV Disease, well i was detected positive on 23th may 2013, and ever since i have been looking for a way to treat and cure this disease from me, but all ways i try there was no solution, few weeks ago i saw a testimony of some people on how Dr Molemen was able to cure them from HIV disease, still on i heard about it on media when a young lady also gave her testimony about this same Dr, well left with no hope i message Dr Molemen telling him all my problem, he told me what we where going to do, that he was going to send me a portion which i am going to take, and after which i took this herb portion he sent to me, he told me to go back to the hospital for check up and after i have done that i should come and tell him the good news result, at first when i saw the message i was so shock and still did not believed i will be cured, well friend to make my story short i am HIV negative now after many time of sorrow, i am Negative, and my sickness are gone, i thank God for leading me to this man…. you can email him on (drmolemenspiritualtemple@gmail.com) or call him on +2347036013351, he can be of help to you on any problem.. I have been HIV positive for 6 years and long for the day to be free of this disease. I would love to be part of any trial that helped find the cure, i have an undetectable viral load and CD4 count of around 1100. I have tried almost everything but I couldn’t find any solution on my disease, despite all these happening to me, i always spend a lot to buy a HIV drugs from hospital and taking some several medications but no relieve, until one day i was just browsing on the internet when i came across a great post of !Michelle! who truly said that she was been diagnose with HIV and was healed that very week through the help of this great powerful healing spell doctor ,I wonder why he is called the great Dr, ADUWAWA, i never knew it was all because of the great and perfect work that he has been doing that is causing all this. so I quickly contacted him, and he ask me some few questions and so i did all the things he asked me to do,He ask me to buy some herbs and which I did for my cure,only to see that at the very day which he said i will be healed, all the strength that has left me before rush back and i becomes very strong and healthy, this disease almost kills my life all because of me, so i went to hospital to give the final test to the disease and the doctor said i am HIV negative, i am very amazed and happy about the healing doctor ADUWAWA gave to me from the ancient part of Africa, you can email him now for your own healing too on his email: ( aduwawaspiritualtemple01@gmail.com ) or call him on +2348131195952,………………. I thank Dr, ADUWAWA. Fresno California, i was HIV positive and i was been sustain with medications but i wasn’t cured. A friend of mine told me about a man called ADAM and showed me testimonies on how people are talking about how this man cured them from herpes and others from HIV but i never believe it. But after much discussion i tough of giving this man a try, I contacted him with his email and he guided me and told me what to do, now according to what he told me all where true. Now I’m free and happy because Dr.ADAM has restore me back to my normal and happy life by giving me a cure for my HIV disease and when i went for medical test i was been confirm HIV negative. So I’m urging you to contact him for help and get cured if you are infected also with any disease or you have any health issues, you can get to him through his email: adamsewin@gmail.com or adamsewin@outlook.com for an easy communication. God bless Dr. Uyi for his marvelous work in my life, I was diagnosed of HIV since 2014 and I was taking my medications, I wasn’t satisfied i needed to get the HIV out of my system, I searched about some possible cure for HIV and i saw a comment about Dr. Uyi, how he cured someone who has been suffering of HIV and i decided to contact him to know if he can cure me with his herbal medicine, I did and he guided me. After a few discussion, he proceed with the preparation of the cure, when he was done, he have the medicine ship to me through the courier service. After i received it, I took the medicine as prescribed by him and 14 days later i went for test and the test result came back negative, Dr. Uyi truly you are great, if you do need his help? Contact him through email: uyiherbalmedicationcenter@gmail.com You can also reach him on phone or whatsAPP: +2348077199766 you can also call him with the following number: +2348065292639. I’m Olivia Megan from United State,I’m happy that my husband is back into my life after 2 years of divorce, Dr.Davi brought my husband back today and i am so excited. I got Dr.Davi email online when a lady was testifying about the strong spell caster who restored her marriage then I said to myself since he helped her, he can also help me,so i emailed him and told him the pain that I was going through,and he told me what to do and i did it,Then he did an urgent Love spell for me. 48 hours later, my husband came back home and with lots of love and joy,and he apologized for his mistake,and for the pain he caused me. Then from that day,our marriage was now stronger than how it were before, All thanks to Dr.Davi. Our family is complete again. If you are going through Divorce/Broke-up since Dr.Davi helped me, he can also help you..email him at: Spelltemple@fastmail.com,Thank you Dr Davi for saving my broken Marriage and brought my husband back to me. I want to share my testimony about my HIV virus that was cured by a herbalist Dr Ogugu with his roots and herbs,Since last 4 years I have being a HIV AID patient. I never think I will live long again and am so grateful about Dr Ogugu who cured my HIV AIDS last week. I was in pains so I told one of my friend and she told me that there is a herbalist that can cure my HIV with his roots and herbs. do contact him now she read someone testimony from a website online on how Dr Ogugu cure her from HIV AIDS and she also collected Dr Ogugu website and email. She gave me the contact info, I emailed him and he prepared herbal medicine for me with his roots and herbs, after two weeks he ask me to go for a test. Which I did, when the doctor told me that am now a HIV negative patient I couldn’t believe myself I went to see another doctor and the result was still the same, Thank God everything is fine, I’m cured by Dr Ogugu with his herbal medicine, I’m very thankful to Dr Ogugu and very happy with my family.Dr Ogugu can also offer any types of help like Curing of all types of Diseases and lot’s more. 18. Leukaemia/lupus virus and many more….